This work documents 32 new Preussia isolates from the Iberian Peninsula, including endophytic and saprobic strains. The morphological study of the teleomorphs and anamorphs was combined with a molecular phylogenetic analysis based on sequences of the ribosomal rDNA gene cluster and chemotaxonomic studies based on liquid chromatography coupled to electrospray mass spectrometry. Sixteen natural compounds were identified. On the basis of combined analyses, 11 chemotypes are inferred. The online version of this article (doi: 10.1007/s11557-017-1305-1) contains supplementary material, which is available to authorized users. This work was carried out as part of the PhD Program “New Therapeutic Targets: Discovery and Development of New Antibiotics” from the School of Masters Degrees of the University of Granada. HRMS equipment used in this work was acquired with a grant for scientific infrastructures from the Local Government, Junta de Andalucía (BOJA-11-Nov-2007). 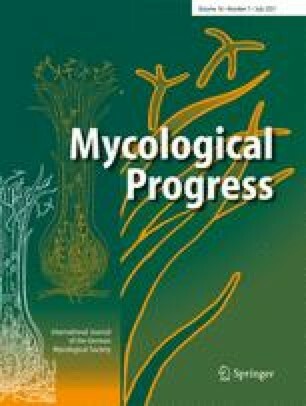 Part of this work was also supported by the Andalusian Government grant RNM-7987 “Sustainable use of plants and their fungal parasites from arid regions of Andalucía for new molecules useful for antifungals and neuroprotectors”. We want to express our gratitude to Dr. Josep Guarro (Rovira i Virgili University, Reus, Spain) for the strains (WQ-056, WQ-023, WQ-124, WO-009, WQ-140, and WQ-064) and Dr. Gerald F. Bills for his comments and support.